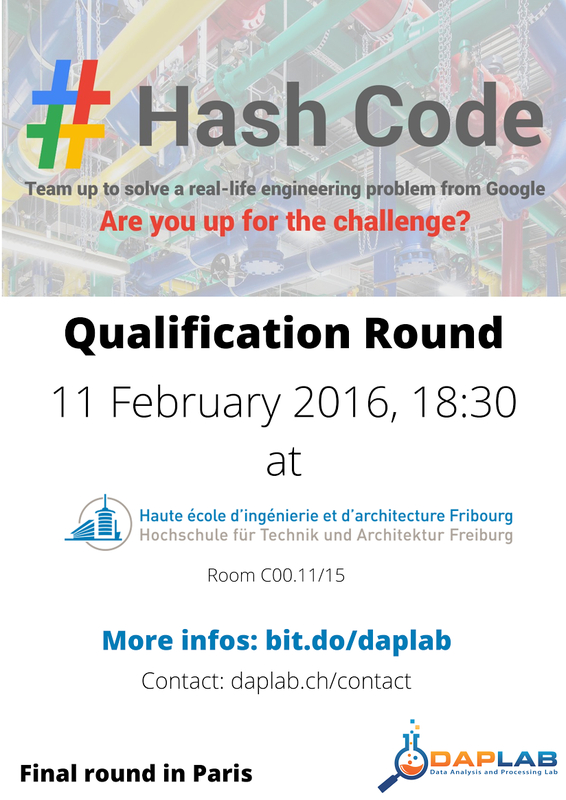 We’re pretty delighted to announce that EIA-FR has accepted to be an official Hub for the next Google #HashCode, Thursday Feb 11. Since Thursdays is our hacky day, let’s code something different (or not, we’ll see :)). When Thursday, February 11. Doors open at 6pm, and will close around midnight. Where Room C00.11/15, Ecole des Ingénieurs et Architectes de Fribourg, Boulevard de Pérolles 80, Fribourg. How Team self-organization. Mind registering before Feb 9, and specify EIA-FR hub in your registration! Power and network connection provided. We’ll open the room C00.11/15 at Ecole des Ingénieurs et Architectes de Fribourg (EIA-FR) at 6pm to give time to warmup our laptops and environments. Signs will be put in place to make your way safely to the room. The official contest starts at 6:30 pm and last for 4 hours. Drinks will be available for participants. Please reach out in Hipchat or @DAPLABCH for more details. Teams can be formed on Thursday, but you MUST register before Feb 9. Please mention you’ll participate through the “Ecoles des Ingénieurs de Fribourg”‘s hub, this will help our logistic!